As I stated on the home page, this is a later addition to the collection, of interest to me because they meet the ‘two hole’ rule, and because I wanted some traditional versions of a cow, bull, ox or water buffalo from the lactose intolerant populations of the Far East... and also, as noted below, because my wife got me hooked on them. Lit. water-dropper. A small container used to hold the water which is added to the inkstone ‘suzuri’ during the grinding of the ink stick. Water-droppers may be made of copper, jade and stone, but ceramic are the most popular. Depending on their size and shape, water-droppers may also be termed suichuu, suichuujou (also suijou), suiu or senjo. More specifically, a suiteki has two small holes for water and air and is designed so that only a few drops of water can fall at one time. Suichuu are shaped like pitchers and have a pouring spout and a handle. Suiu and suijou are bowl or jar-like, and some have wide mouths, making them popular for use as brush washers (hissen), while others have small mouths. Senjo, or "toad", was so named because a toad was believed to hold water in its large belly. Thus many jade toad-shaped water-droppers exist. At first the suiteki was simply a jar or bowl used for holding water, but as interest in the accoutrements of calligraphy grew, water-droppers became more specialized. Bronze water-droppers in the shapes of fantastic creatures [monsters], ceramic suiu and teapot-shaped suichuu were created in China and found their way to Japan and became popular with the literati of the Edo period. In Japan, suiteki were already used in the Nara period (7c) when sutra copying flourished. A set from this period made up of a bronze water-dropper, a spoon and a tray used to hold the ink stick are preserved at Houryuuji, Nara. Since the late Heian period (11c), a special kind of writing box ‘suzuribako’, which includes the water-dropper, in addition to the ink stone and other writing tools, became very popular. The water-droppers varied greatly in material, shape and design. Notable, are the elaborately designed ceramic suiteki, including many animal-shaped examples, that were found among old Seto (13c) and Oribe (16c) wares (see ‘setoyaki’, ‘oribeyaki’) Water-droppers of richly colored cloisonne (shippou) also became popular from the 16c. I sure hope JAANUS doesn’t mind my passing on their information to cow-creamer collectors. 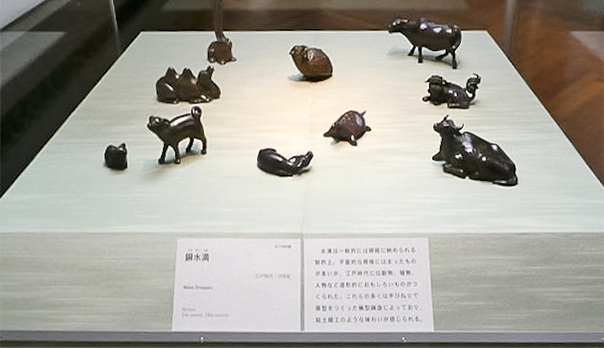 We noticed three cows among this 19c Edo period bronze water dropper collection in the Tokyo National Museum. Naturally enough, since for some reason the museum didn’t want to part with them, I started hitting the web to learn more about them. There’s also a (pricey) book entitled “Suiteki - The Art of Bronze Water Droppers” if you really want to get serious. I may not have been able to buy the bronze cow suiteki that were in the museum, but I have managed to acquire a few lovely examples, such as these simple reclining beasts. The larger and fatter one came to me from Kumamoto, on the western shore of Kyushu. The other arrived from Okayama in southern Honshu. Many of my other Japanese suiteki feature what would seem to be working bulls or water buffalo, but these are pretty clearly cows for milking or more likely for eating. The fatter one looks like it would be great for the world renowned Kobe Beef. Both are beautifully molded and cast, and the smaller one even has the leg beneath depicted. 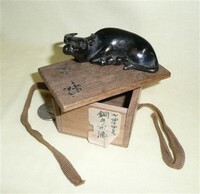 This lovely bronze Japanese suiteki of a reclining water buffalo has its own wooden box, and came marked as 19c Tokugawa era. The seller notes he acquired it from the San Francisco Asian Art Museum. I’d be delighted to learn the English translation of the Japanese characters on the box and its attached paper. 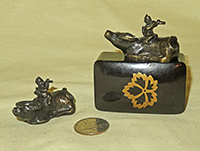 Here is a well-crafted but rather unusual bronze Japanese suiteki. The bull appears to be in considerable pain with its eyes wide, right foreleg raised, and a small animal clinging to its rump. I can’t figure out what that animal is – but presumably it has claws and is more interested in meat than companionship. There may well be a story or ‘fairy tale’ that goes with it, but the Japanese seller provided no information. This small but very well done early 20c copper or bronze suiteki of a boy with a flute riding a water buffalo came to me from Okayama, Japan, which is about half-way between Kobe and Hiroshima. The seller told me that the boy or man riding a water buffalo is a traditional theme of Zen Buddhism – which of course sent me to digging through the web. I learned that this is a representation of the sixth stage from an early Taoist story of the ‘Ten Bulls’ that (according to Wikipedia) may represent a Zen Buddhist interpretation of the ten stages experienced by a Bodhisattva as outlined in various Mahāyāna sūtras. The wikipedia article states that the story as related by the 12c Chinese Zen master Kuòān Shīyuǎn has pictures, poems and short pieces of prose that “tell how the student ventures into the wilderness in his search for "the Bull" (or "Ox"; a common metaphor for enlightenment, or the true self, or simply a regular human being), and how his efforts prove fruitless at first. Undeterred, he keeps searching and eventually finds footprints on a riverbank. When he sees the bull for the first time he is amazed by the splendour of its features ('empty and marvellous' is a well known phrase used to describe the perception of Buddha nature). However, the student has not tamed the bull, and must work hard to bring it under control. Eventually he reaches the highest Enlightenment, returns to the world and ‘everyone I look upoon becomes enlightened’.” The sixth stage has the man riding the bull home in great joy, and in the 12c picture he is playing a flute. 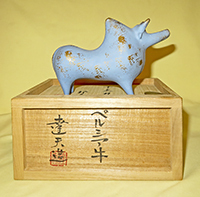 Whether or not this is the correct interpretation of this suiteki, many in my collection – Chinese as well as Japanese – feature a person riding, climbing or lying on a standing or reclining bull (water buffalo). 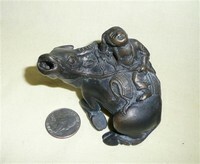 Here is another older Japanese bronze with a similar theme – in this case, both the man and the ‘bull’ are peacefully reclining. 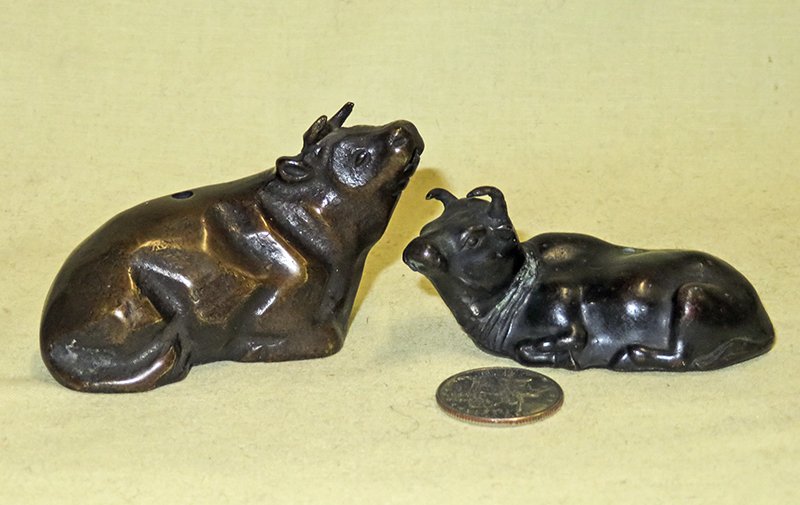 Here is a nice pair of reclining bronze Japanese water buffalo – great detail, down to the rope through the nose. One of these came to me from California a couple years ago – then I couldn’t resist its twin, which arrived direct from a seller in Tottori-shi, Tottori-ken, Japan. That of course sent me to the web, where I learned that Tottori Prefecture, located in the Chugoku region of southwest Honshu, is the least populous prefecture in Japan, and has the nation’s only large area of sand dunes. From Wikipedia, always the source of fun information, I found that ‘The word "Tottori" in Japanese is formed from two kanji characters. The first, 鳥, means "bird" and the second, 取 means "to get". Early residents in the area made their living catching the region's plentiful waterfowl. The name first appears in the Nihon shoki in the 23rd year of the Emperor Suiko when Yukuha Tana, an elder from the Izumo, visits the emperor. The imperial Prince Homatsu-wake was unable to speak, despite being 30 years of age: "Yukuha Tana presented the swan to the emperor. Homatsu-wake no Mikoto played with this swan and at last learned to speak. Therefore, Yukaha Tana was liberally rewarded, and was granted the title of Tottori no Miyakko." This very heavy bronze, well made suiteki with a mythical beast in a medallion on each side and a very lerge ornate handle is said to be Meiji (1868-1912) from the late Edo period, and has a 3-character maker’s mark on the bottom. It came from the collection of Masayuki Sashide of Yokohama, who was a well known collector as well as dealer. It was acquired by another knowledgable collector/dealer who became closely acquainted with Sashide while he lived in Yokohama in 2009-2010. He called it a robust water buffalo, and given the provenance I think that’s what it is intended to represent. 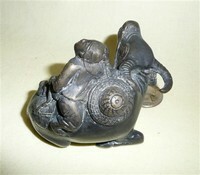 Here is a very similar suiteki, differing from the one above in the nature of the lid and the designs on the side – here a large dragon on the left, and a mythical bird on the right. 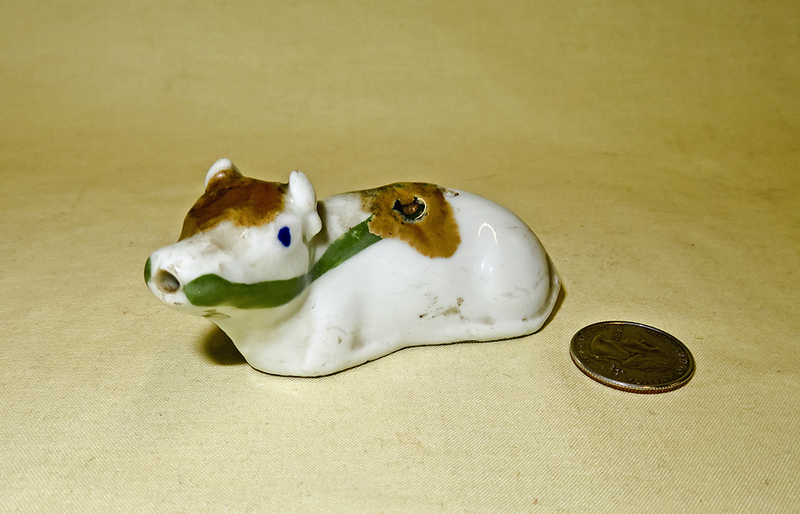 This adorable little porcelain bull with a conical hat on its back is Seto ware, and was said by the knowledgeable seller to be about a hundred years old. Of course I scampered to the web to find out a bit about Seto, which is in Aichi Prefecture, some 20 km NE of Nagoya. I learned that Seto is one of Japan’s most important ancient kiln towns (along with Bizen, Echizen, Tokoname, Shigaraki and Tanba), and indeed is so closely associated with ceramics that ‘setomono’ (瀬戸 物)which translates simply as seto ware, is the Japanese generic name for pottery. Ceramic production in Seto dates back to the Heian period (794-1185), but according to one of the web sources became prominent in the 13C when the craftsman Toshiro Kato set up his kiln there on his return from China where he learned porcelain production. He selected Seto because of its two types of high quality clay (kibushi and gaerome), and naturally enough a number of other artisans followed his lead. These days Seto is noted for its several ceramics museums and festivals, as well as ceramic production which now includes industrial appliances as well as artistic pieces. 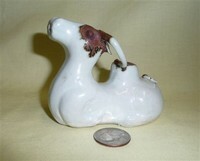 This very fine Japanese example, a small resting porcelain Bull, is from the early Showa period, ca 1930.I acquired it from a Honolulu antique store. This very cute small blue-eyed ceramic Japanese suiteki came to me from Nagasaki. The seller said (in 2019) that he thought it was about 40 years old. Here is a second bizen ware or, as the Japanese seller calles it, bizen-yaki suiteki, this time in the form of a seemingly well fed and contented reclining cow. The seller states that it dates from the Japanese Meiji period, 1868-1912, and notes that bizen does not have glaze applied, rather that a sort of natural glaze develops in the kiln. He also says, "sometimes we represent it with a Wabi-Sabi". I dashed to Wikipedia for help with that, and discovered that "In traditional Japanese aesthetics, wabi-sabi (侘寂) is a world view centered on the acceptance of transience and imperfection. The aesthetic is sometimes described as one of beauty that is "imperfect, impermanent, and incomplete". It is a concept derived from the Buddhist teaching of the three marks of existence (三法印 sanbōin), specifically impermanence (無常 mujō), suffering (苦 ku) and emptiness or absence of self-nature (空 kū).Characteristics of the wabi-sabi aesthetic include asymmetry, roughness, simplicity, economy, austerity, modesty, intimacy, and appreciation of the ingenuous integrity of natural objects and processes....According to Leonard Koren, wabi-sabi can be defined as 'the most conspicuous and characteristic feature of traditional Japanese beauty and it occupies roughly the same position in the Japanese pantheon of aesthetic values as do the Greek ideals of beauty and perfection in the far West.' Whereas Andrew Juniper notes that 'If an object or expression can bring about, within us, a sense of serene melancholy and a spiritual longing, then that object could be said to be wabi-sabi.' For Richard Powell, 'Wabi-sabi nurtures all that is authentic by acknowledging three simple realities: nothing lasts, nothing is finished, and nothing is perfect.'" This lovely piece does have a tiny chip on the tip of the left horn, but given the above definitions, that seems totalkly appropriate. 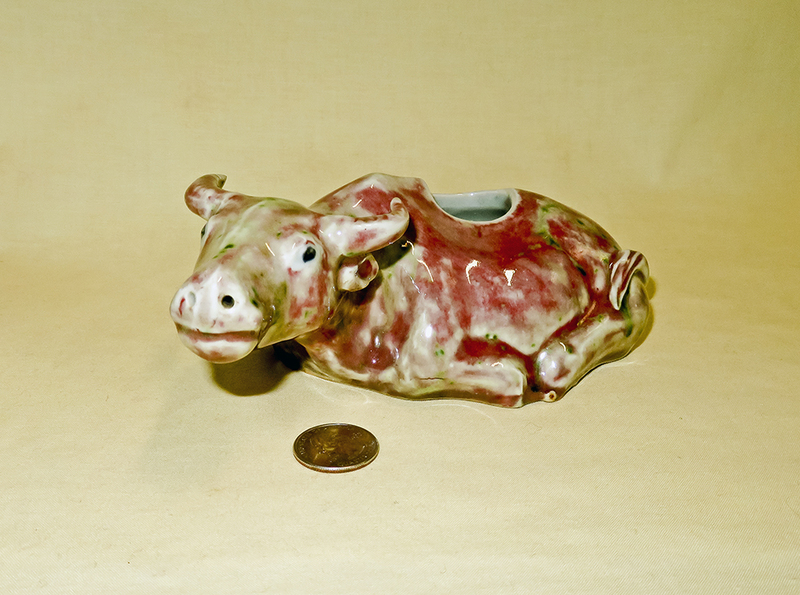 This very cute little bull or cow of white clay with heavy black glaze is Kyoto ware, also known as Kiyomizu-yaki . It dates from ~1985 and was made by and marked for Kenji Suzuki (1935-2010), a renowned Kyoto artist who is succeeded by his sons Kenji II and Takuji. One blog on the web states that he said he used glazes from the ash of an orange tree or bamboo near his home. This interesting Japanese celadon suiteki of unknown date – but not new - came from Kobe. 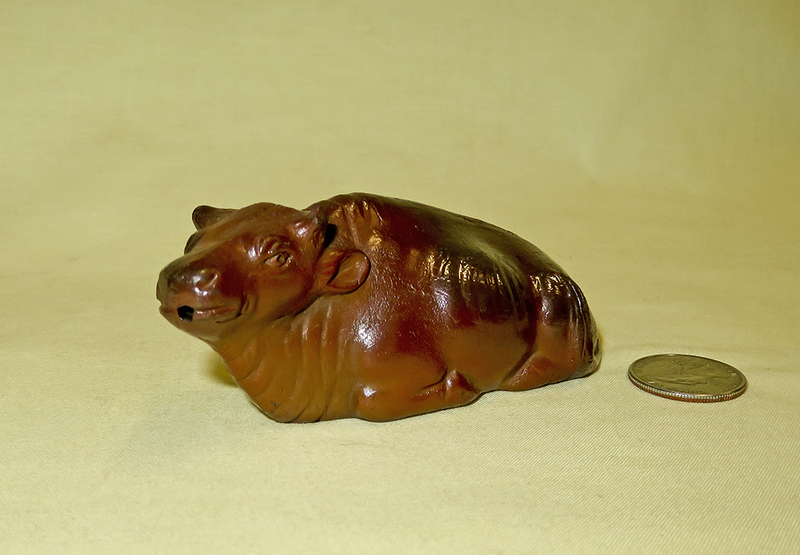 This simple but lovely rectangular water dropper with a raised sleeping cow is also presumably Japanese. I have seen it offered in dark brown as well. 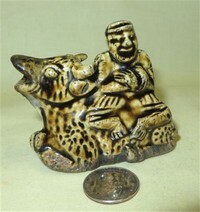 This is an interesting heavy suiteki of a boy on a water buffalo, possibly Korean. It has lost its right horn. Moving now to Chinese calligraphy suiteki (although I doubt that Japanese term is the name they use) let's start with two water pots - no 2nd hole - used for washing bruishes. They are another exception to my rule, but are very well made and accompany the water droppers and other 'scholar's' implements for writing and painting. They are often referred to (on ebay at least) as suiteki suichi. 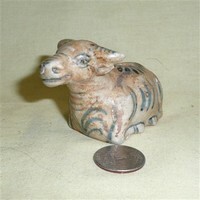 This water buffalo or bull is particularly beautiful as well as quite large (7” long). Ito is glazed in what the seller termed ‘sang de boeuf’. From Carters.com we learn that “Flambé glazes, termed ‘sang-de-boeuf’ (ox blood) were in use by the Chinese from the 11th century, and the effect was achieved by using copper oxide as a colouring agent and firing the object in a reducing atmosphere. In the 18th century the red glaze often accumulated on the shoulders of vases and bowls, reproducing the effect of coagulated blood. Sometimes the glaze was often slightly streaked, or included blue bleeds and wares with these features were prized by collectors in the 19th century. European potters were not able to master the technique until the early 20th century.” The glaze on this pot seems to me to be somewhat too light for that, and is mottled with a grey-green background and dark green occasional spots. Perhaps some expert can enlighten me. Like other of my vintage Chinese pieces the bottom is rough and unglazed. It came to me from northern Wales, but the seller said she bought it at an antique center in Singapore around the turn of the millennium. 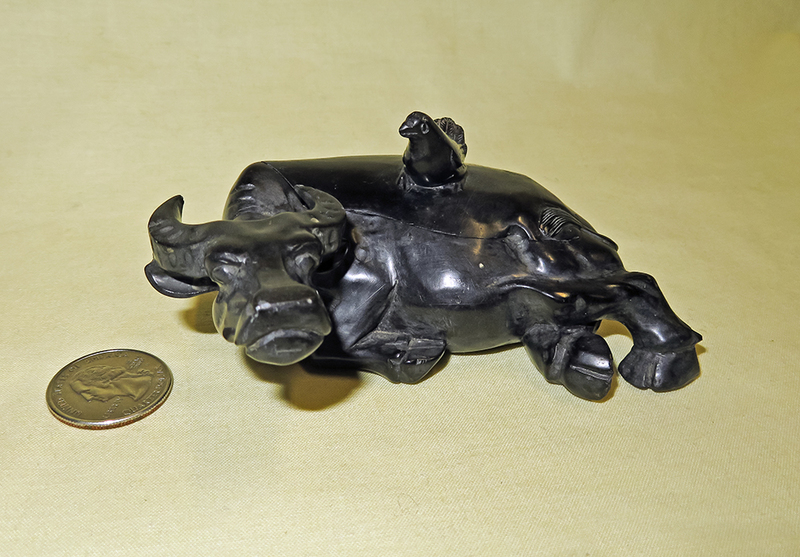 This black stone water pot of a reclining water buffalo has a lid with a bird on top. It's modern, post 1940 according to the seller's description. 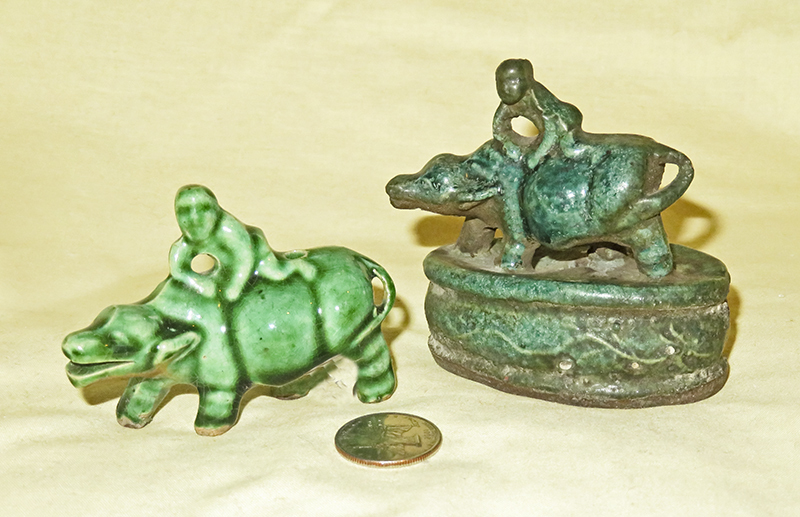 This pair of early earthenware Chinese water droppers picture what the seller said were ‘immortals’ riding water buffalo or bulls. The bulls and the fronts of the men (but not their faces or backs) are coated with Sancai which (again turning to Wikipedia for information) translates as ‘three colors’ and “ is a type of lead-glazed pottery: lead oxide was the principal flux in the glaze, often mixed with quartz in the proportion of 3:1. The polychrome effect was obtained by using as coloring agents copper (which turns green), iron (which turns brownish yellow), and less often manganese and cobalt (which turns blue).” The seller said that this pair came from a large Chinese collection and is 17c Ming or Kangxi. The Ming Dynasty lasted from 1368-1644, and was followed by the Qing (last Imperial) dynasty which lasted until 1912. Kangxi, considered one of China’s greatest emperors and the longest-reigning, was the 4th Qing emperor, and ruled for 61 years, from 1661-1722. It would take an expert to verify this attribution or narrow things down a bit and I’m certainly not one, but at the very least it makes a good story and these very interesting water droppers are fully appropriate to lead off my Chinese water dropper area. 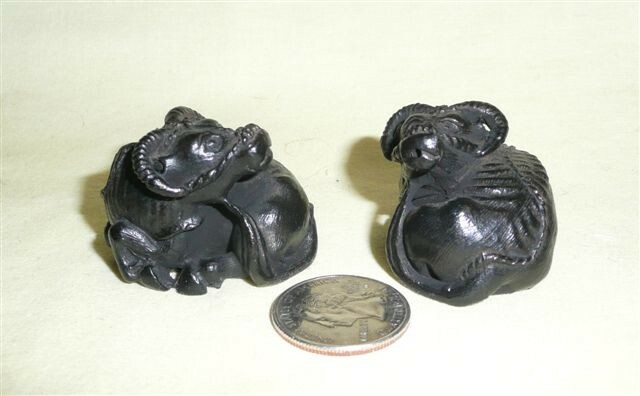 This nicely molded long-snouted water buffalo with a faceless rider that appears to be mostly lying down, has a deep caramel glaze above but is unglazed below. The seller said it came from the estate of a former marina operator who had an extensive and quite fine Chinese collection, and although he himself knew nothing about it, it had a tag reading Ching (Qing) Dynasty, Tao Kuang Period 1821-1850. 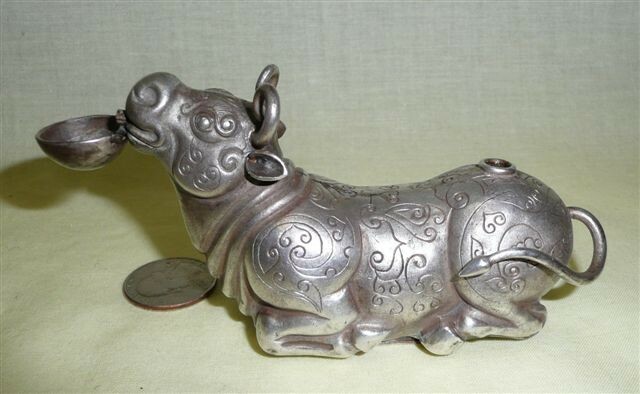 This silver kneeling bull with a little cup on a hinge under its chin is also Chinese. I have seen horse and sheep versions of this form. This is a very bright Qing Dynasty water dropper – the seller called it an antelope but it looks like a fanciful bull or water buffalo to me. It’s very pretty in any case. It comes in other colors also - all of them quite pricey. This one is also Chinese, and probably also Qing dynasty – certainly not a modern reproduction. Boys apparently like to climb onto the back of water buffalo. Here are 4 versions – the reddish one in back with the boy with a light colored head is a modern water dropper made of Yixing clay . 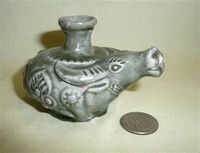 This clay, from the region near Yixing in Jiangsu province, has been used since the Song Dynasty and is very popular for teapots because their unglazed surfaces absorb traces of the contents, leading to a more complex flavor…thus they should never be washed with detergents, or used for more than one type of tea. The bark brown one with the boy with a green shirt and purple shorts came to me from the Netherlands and was said by the seller to date from ~1900. Its quality and the look of the clay lead me to believe that’s not unlikely, and one like this may have served as the model for the others. The dark green one on the lower left is less well molded, glazed on the bottom, and likely somewhat younger. It came to me via an antique shop in Missouri. 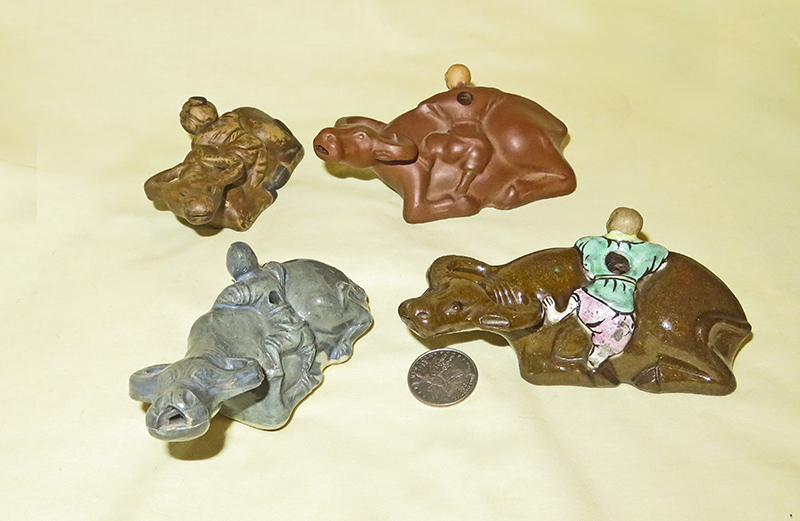 The fourth, of brown clay in the upper left comes from a slightly different mold; the boy’s head is larger and his face more expressive, and the fill hole if on the water buffalo’s but rather than the boy’s back. 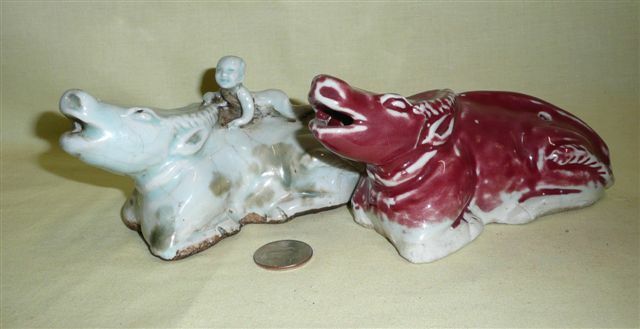 Here are three modern Chinese porcelain suiteki all featuring the same reclining ox or water buffalo – two on a rock and the third on a seal. They all hail from Bejing. These are exceedingly large (for a suiteki) modern Chinese water droppers. I first acquired the red one – couldn’t resist at 99 cents plus postage – and then found the grey one with the naked boy on top for considerably more, but with postage paid from Beijing. My wife, a calligrapher, tried them both and says that the one with the boy has the filler/stopper hole in a much more convenient location for a right-handed person. 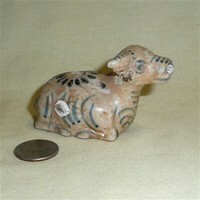 Here’s another fairly large one, a Chinese celadon kneeling ox or water buffalo, pudgy and cute. It was advertised on eBay as being from the “Long Quan Kiln” which of course sent me right away to Google. From chinaculture.org and chinauniquetour.com I learned that “The porcelain of Longquan ware represented a great school of southern celadon that arose in the Song Dynasty (960-1279). It was manufactured in fairly vast areas in the southwestern part of East China's Zhejiang Province. The sites of former celadon kilns and workshops are found throughout the counties of Lishui, Suichang, Yuehe, Qingtian, and Longquan on the upper Oujiang River, with Longquan as the production center. There were also many kiln sites in Pucheng along the Songxi River in the northern part of East China's Fujian Province”…and more, should you care to go to those sites. Wikipedia also has a nice article about the many kilns in the area. Pretty obviously mine – which cost ~$9. - does not date from the Song Dynasty; but my attempts to learn more about current Long Quan kilns from the seller came to naught thanks to his paucity of English. Although this water dropper came from a dealer in Japan, he assured me that this is Chinese and is somewhat older although he wouldn’t guess at the age. The air hole is a square in the man’s back, so it was made for a right-handed calligrapher. The funny little man sitting sideways on his unhappy bull is barefoot. As is the case with some of my other older Chinese water droppers, the bottom and base are unglazed. Two more old men on water buffalo, both seemingly content. The celadon version, which came from Guangdon China, seems to have been made to be held in the left hand. Both of these appear to me to be modern. Here are some additional Chinese examples. These two came from the same mold, although I didn’t realize it because they came at separate times. The darker green on the base one has a ‘seal’ on the bottom with what look to me like squiqqles but are presumably script characters; the light green one was said to be ‘min kiln’, but although I have found a number of other ceramic pieces so labels for sale on ebay and elsewhere, I have been unable to locate a meaningful definition. . This rather large, stylized, modern water dropper – I’ve seen it offered in a variety of colors – may not have been intended to be a cow, but then I occasionally have a rather vivid imagination. 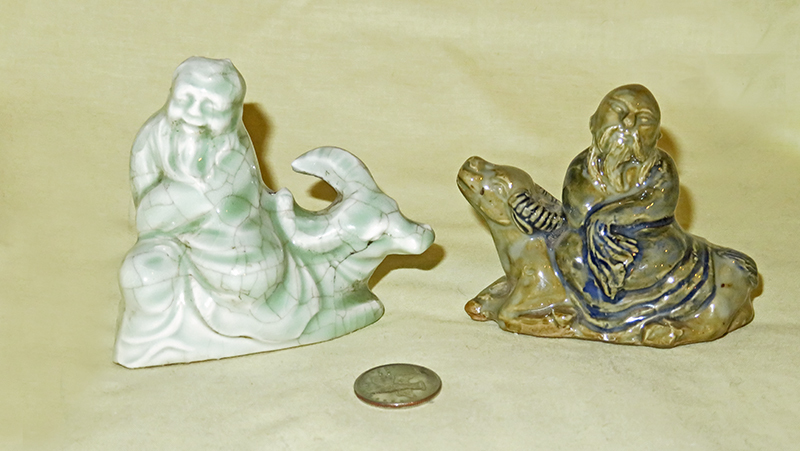 These four soapstone small Chinese suiteki are fairly old – said by the seller to come from a “large collection of high quality antiquities from an estate of the daughter of a former merchant sea captain stationed in Asia.” I’d guess them to be probably early 20c. This water buffalo or bull is even older: 15c Vietnamese, recovered from the Hoi An shipwreck. The seller, Ethnix Tribal and African Arts of NY (they have a really neat web site) provided the following information in the eBay description: “In the mid 15th century a junk loaded with over 250,000 fine examples of Vietnamese pottery sank to the bottom of the South China Sea in an area called the Dragons Embrace, 40km off the coast of Vietnam. The shipwreck was discovered by Vietnamese fishermen who began pulling up huge amounts of pottery in their nets. Subsequently the Vietnamese government hired a salvage company to recover the massive amount of sunken treasure which was to be auctioned later in the major auction houses, in London, Paris, New York, San Francisco, etc. As a result, the Hoi An sunken treasure has provided both financial and scholarly rewards. Sales proceeds, amounting to tens of millions of dollars, have gone to build museums in Vietnam and to pay for further excavation and research. With the discovery of previously unknown ceramic forms and design, the historical and artistic relationship between Vietnam and China has been redefined and the quality from this little known chapter of Vietnamese artistic tradition has been recognized. This piece was purchased in an antique shop in Saigon”. For more information about the shipwreck, go to http://www.thingsasian.com/ and search for Hoi An shipwreck. Really neat stories here. 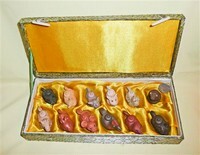 No, not all cows…but there is a bull in this set of clay Chinese zodiac suiteki in a brocade box. Cute…couldn’t resist.